Isolated from the world for 80 million years, New Zealand boasts some of the world’s most unusual animal species. The ultimate evolutionary island laboratory. 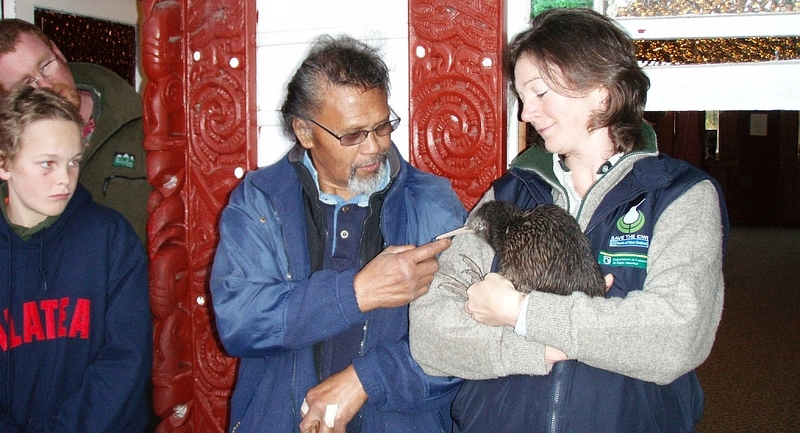 Today we profile Sarah King, a Biodiversity Ranger in the Te Urewera Whirinaki Area Office. 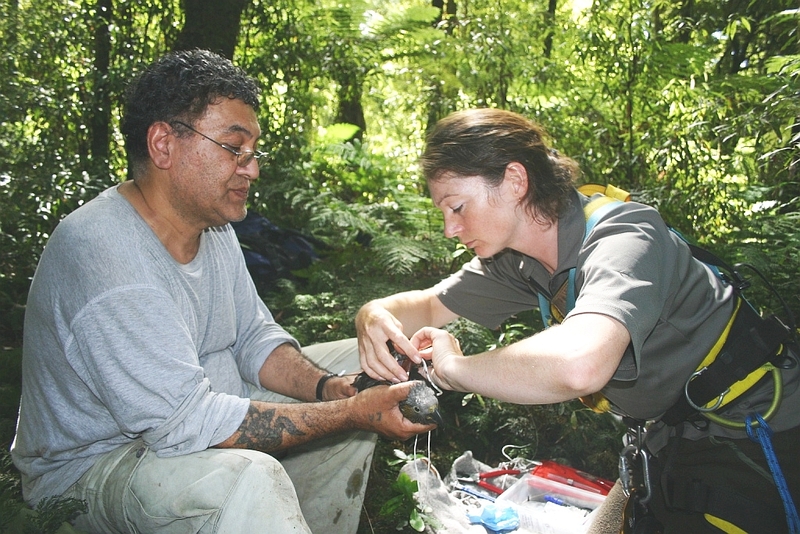 Sarah and her helper tend to a kaka in Whirinaki Forest. Some things I do in my job include… Monitoring birds and bats, catching and handling threatened species (the plants are a real trick to catch), and showing other people some of the cool stuff you can see in the bush. The best bit about my job is… Getting up close to some awesome critters. The funniest DOC moment I’ve had so far is… Being bait to catch falcons, wearing a chief’s hat with leg nooses on top. I had to get up on a tree stump to be taller than my co worker so that the falcon would strike me—best time I’ve ever had being bait. 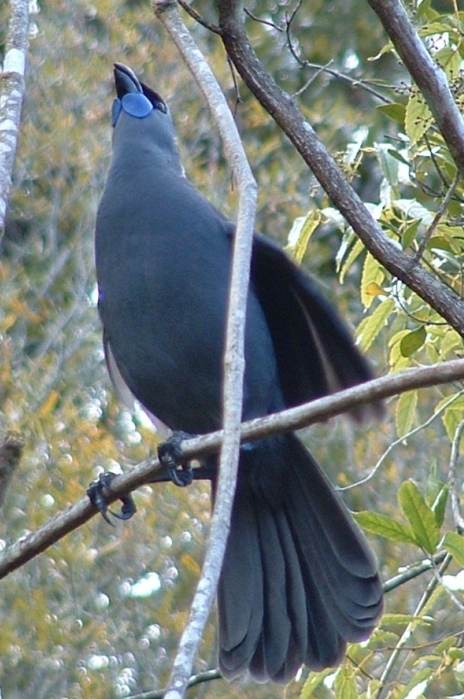 The DOC (or previous DOC) employee that inspires or enthuses me most is… Jeff Hudson, he taught me all that he could about the ins and outs of kōkako. His enthusiasm was so infectious that even though he’s passed away I can still feel him nudging me on to find out more. Most people don’t know that I… Can cross country ski (I’m not saying ‘well’ though). 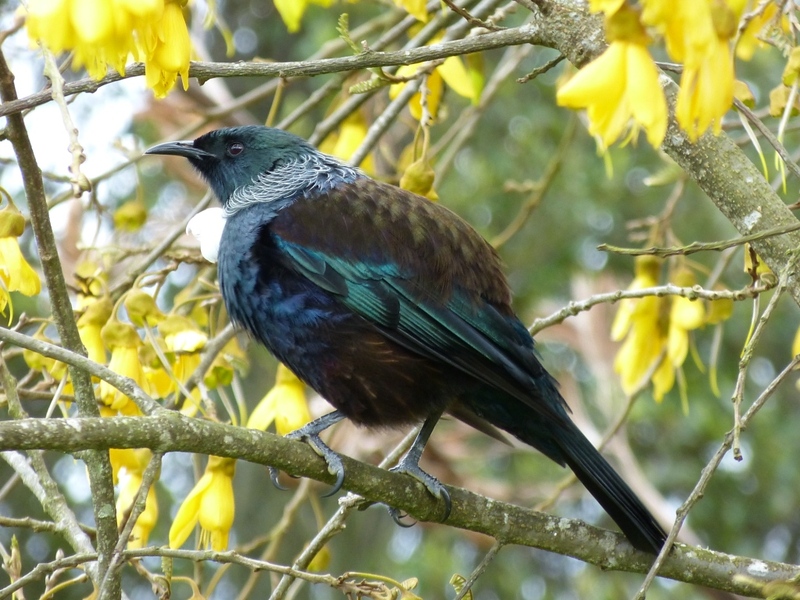 My stomping ground is… The Whirinaki Forest. If I could trade places with any other person for a week famous or not famous, living or dead, real or fictional it would be… Sir David Attenborough, what a life! 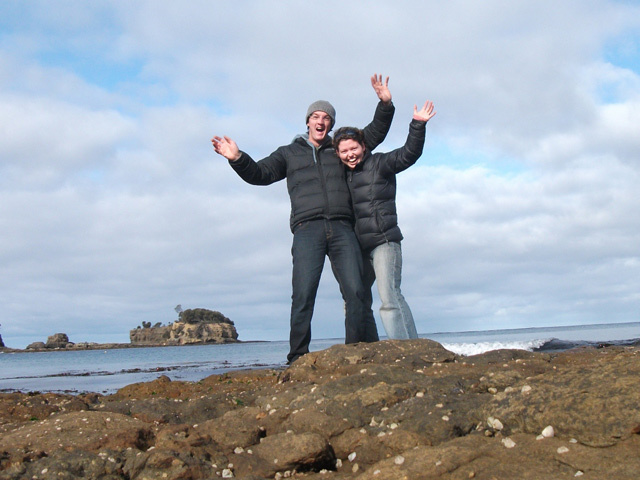 My best ever holiday was… In Tasmania with my partner, catching Tazzy devils and platypus, searching for gems in the creeks and finding as many cool critters as possible. If I could be any New Zealand native species I’d be… A falcon—high speed aerial agility; that’d be a rush. My favourite quote is… Don’t really have one but this one’s quite good: “You only live once, but if you do it right, once is enough.” Mae West. The best piece of advice I’ve ever been given is… ‘Take the time to look around you, you never know what wonders you might chance to see’. In work and life I am motivated by… Enthusiasm. It breeds more enthusiasm, and if it’s directed towards saving threatened species then that’s the best sort. My conservation advice to New Zealanders is… Don’t take our forests and wildlife for granted, just 50 years ago we had so much more than we do now and people assumed it would be there forever. What little we have left: treasure it, get out and see it and fight for it because soon it could be gone forever. 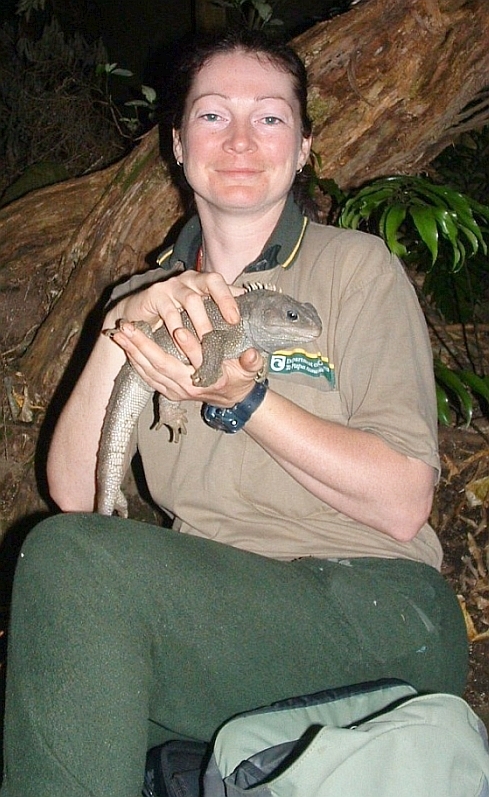 Today we profile Jess Scrimgeour, Technical Advisor – Ecology. Name: Jess Scrimgeour (I’ve seen a variety of wonderful and creative spelling errors of my last name, but my favourite has always been Mrs. Scrimblabla). 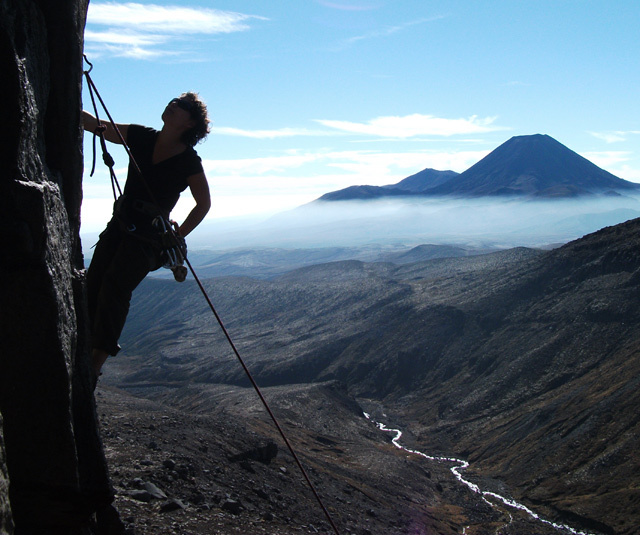 Out on a beautiful day climbing at Ruapehu, with Ngauruhoe in the background. Can you believe it’s only a half hour drive from home? I work with the Department of Conservation in different areas to help them to do what they do best, and often have conversations with rangers/programme managers/community groups around “Are we doing things right? Can we do them better? And if so, how?”. Then I (hopefully) can help find a better way of doing things, whether this be through designing robust monitoring studies, training people, doing some data crunching or talking to someone who knows the answers I don’t and taking the credit for their smarts. 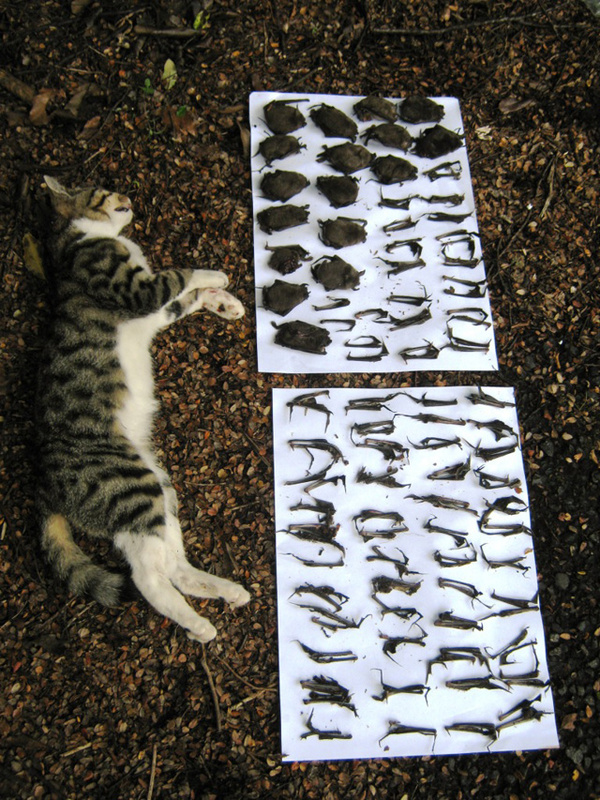 So if you think you’ve got an ecological problem that you need a hand with, give me (or any other technical advisor) a yell. I’m told I can be quite useful at times. Oh, and I occasionally get pulled to the front desk to identify cool critters that the public bring in; just recently a wriggling of maggots. Did anyone else know that that’s what a group of maggots is called? I had to look it up. Only one thing? I suppose it’s the small things that are best (shout out to all the shorties! ); when I’ve helped someone with a problem and we get to a good solution at the end. It’s a feeling of teamwork, of being useful and that maybe today we might have made a difference. Those are the days I love the best. And that has a lot to do with the fact that I am very lucky to work with a great bunch of people in DOC. My husband once said that if my pay stretched to include all the hours I think about work outside of work hours, I’d only be paid a pittance. He didn’t actually use the word pittance, because he doesn’t really talk like that, but I think it’s a rather dashing word. I am yet to learn how to leave work at work, and find it intrudes at the most inopportune (another dashing word!) time. I grew up in a National Park in South Africa, and from a young age wanted to be a wildlife ranger like my best friend’s dad. I’d like to say it was because at such a tender age I’d already developed strong conservation ethics, but truth be told it was the lure of adventure and heroism, with dreams of saving the world from poachers, and staring off with my binoculars, serious and intent on my purpose (and the wind in my hair for added heroic effect). I didn’t waver (much) from this dream when moving to NZ, and I like to think I work in conservation now for all the right reasons—but every now and then I stare off in to the distance, humming my own theme song…. Well, I’ve just been on a climbing trip to Australia for three weeks, and work has yet to delight me with a better highlight. For other climbers out there, we went to Blue Mountains, Freycinet and Mt Arapiles. It was awesome. My husband Ben, who gave me the name Scrimgeour. He also works for DOC so is likely to read this, so I better watch my tongue. Hi Ben! Being outside on a beautiful day climbing with friends. What I mean by this is maybe two or three climbs, with the majority of the day being used to talk about all the epic climbing we have done on all the other days when we climbed so epically (no one can ever name any specific examples of those days though…). My back garden, which through some trials and many an error was transformed from a weedy corner in to a sanctuary of native plants, a pond and a beautiful bench Ben built for me. Turns out the pond breeds mosquitoes like you wouldn’t believe, but I love it still. When I can hear someone chewing food, I physically have to remove myself from the sound. It has the same effect on my nervous system as hearing nails scraping down a black board—an immediate and violent reaction that leaves my teeth on edge. Worse yet when you’re stuck in a plane with some punk kid next to you eating his food with an open mouth—the horror! I get irrationally irritated when I’m brushing my teeth in the morning and someone (who shall remain unnamed) decides that’s when he needs to brush his teeth too. We have all morning to coordinate teeth brushing activity, but after four years of marriage we still haven’t sorted it out. Busy supermarkets. Nothing worse than that lady who parked her trolley in the middle of the aisle at peak rush hour to peruse the shelf, holding everyone else up on either side, only to decide she didn’t want anything there in the first place. Too late, lady, we’re already in gridlock and require traffic management to get things moving again. A feeling very akin to road rage…. Basil pesto. If I could have basil pesto on everything I would, but I feel like I might die of coronary heart disease before the age of 35. Pureora Forest. Beware the magic of that place, it’ll get hold of you and never let go. Rangataua Forest (outside Ohakune). I’ve spent many an hour here amongst the giant red beech doing bird and bat monitoring (6000 strong short-tailed bat population!). It’s burrowed itself deep into my heart. Oddly enough, Turangi. People give the place a hard time, but I love my wee little home in this wee little town. Movie: The first one that popped in to mind was ‘August Rush’. Still tugs at the old heartstrings. I’m quietly shoving my vast collection of animated movies under the sofa as we speak—apparently it’s unseemly for a grown woman to still go dewy eyed over ‘The Little Mermaid’. Album: Right now, it’s Lana del Ray ‘Born to Die’. She has a beautiful voice and a somewhat morbid drama to her songs. But the album listened to the most in our household is probably Foo Fighters ‘Echoes, Silence, Patience and Grace’. Book: If you’re a bit of a fantasy buff, then I would recommend ‘Name of the Wind’ by Patrick Rothfuss. Pure escapism, and despite having read it three times already, I plan to do so many times more. Life is going to turn out great, so relax and enjoy the ride. Oh, and you should pay more attention in stats at uni—you’re going to regret all the doodling you did in class. My parents inspire me greatly. They have this amazing ability to draw everyone in around them and make them feel valued. They instilled in me the belief that everything we do has an effect on others, so always respect those around you. I try and uphold them each day in the way I behave, so that they will be proud of the daughter that they raised. A wildlife ranger! Although I did briefly dabble with acting in high school, and almost convinced myself that I might just be good enough to make it as a career. Luckily common sense prevailed and I recognised that I possessed far more enthusiasm than skill. I continued acting throughout university, but nowadays I content myself with being my own little drama queen at home (and sometimes at work). A teacher. 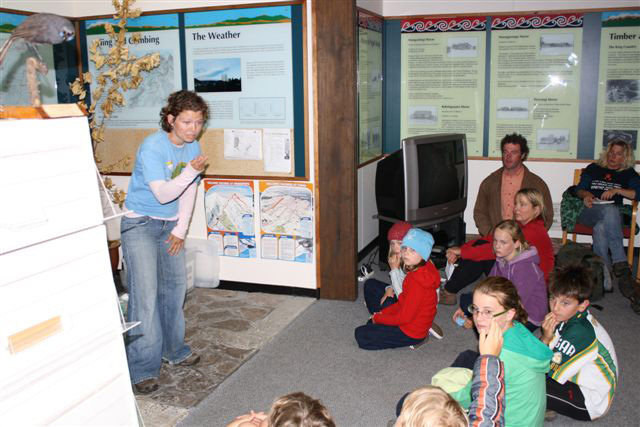 Before starting with DOC in Turangi I was a rainforest ecology lecturer for undergraduate students in Australia, and I discovered a passion for it. It’s still one of the aspects of my current job I love best; doesn’t matter whether it’s teaching kids about native species, teaching community groups how to do bird counts or even teaching someone how to do pivot tables. I reckon if we want to make a real difference in the world, it’s teaching the next generation how to be better than we were. That moment when you see someone start to understand, and then see that spark grow in to action—brilliant! Teaching kids about conservation as part of a summer programme about night creatures, where we all painted our faces like bats and owls. Recycle and re-use. Go down to your local dump—it’s amazing the things people throw away. Someone else’s trash might just be your treasure. My favourite treasures found so far are a beautiful wooden abacus, a Michael Jackson vinyl record in perfect working condition, and a hand painted picture of Mt Ngauruhoe. Same goes for op-shopping, there’s some fashion jewels out there, even if the wider community doesn’t quite agree with your idea of fashion. Ride my bike more, and stop being such a wussy about it when it’s rainy or cold. 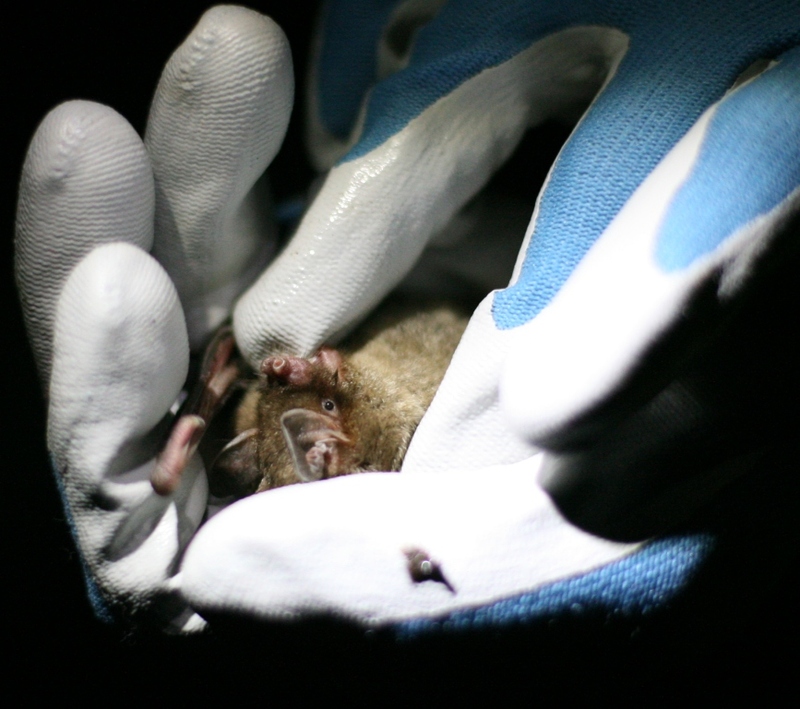 A short-tailed bat. They roost together in their thousands; they seem to me to have a great capacity for friendship and loyalty (my aversion to sharing a bathroom may not stand me in good stead here though). They might be small, but when threatened they’re feisty things. Even grown men have a healthy respect for those teeth when handling them. And they break the universal rule of the bat world each night by walking the earth. That’s pretty awesome. 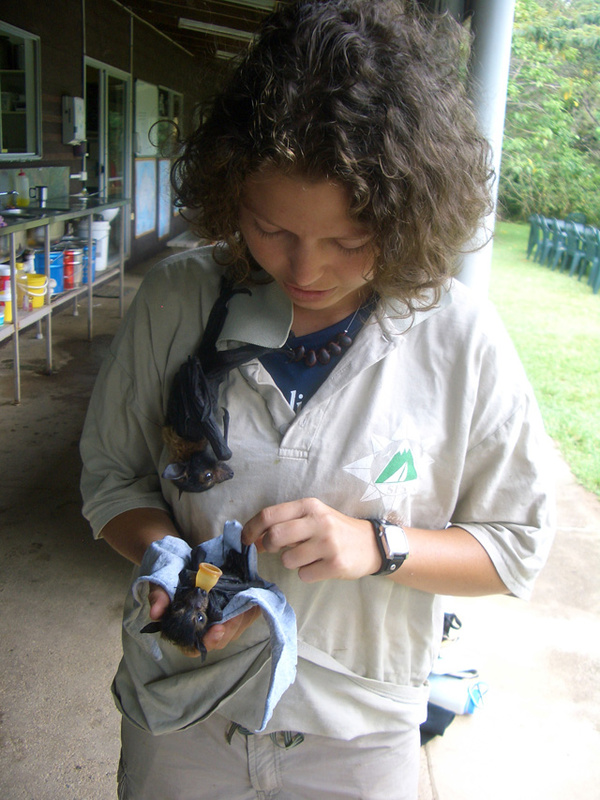 Pre-DOC I taught rainforest ecology in Australia, and one of the best experiences was giving lectures whilst raising orphaned fruit bats. They were my most attentive students! Be proud New Zealand. Our environment and everything in it is without compare. Take your children in to the forest, along the streams and up the mountains. Teach them the value of what we have, so that they might protect it and teach their children too. We value your feedback, please continue to post comments below.